Coaxial cable consists of a core conductor, surrounded by PTFE dielectric, covered with a metal shield and finally encased in a insulating jacket. The shield provides the return path as well as the confinement for RF energy, and is generally grounded. Coaxial cable is a transmission line ‿it allows transmission of high frequency energy and signals with low loss with reflection-less matching and with minimal Phase and Amplitude distortion. GARG offers customized coaxial cable designs ranging from 1.0 mm OD subminiature and standard miniature to high power sizes. These designs provide greater packaging density, signal fidelity, low noise, flex durability, lower capacitance and propagation delay. There is also a choice of flexible or semi-rigid constructions. "Standard Cables meet popular military standards (US Navy's MIL-C-17, Indian JSS 51100) while custom cables can be designed according to the requirement. 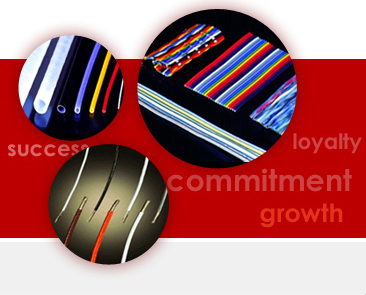 Our cables meet airworthiness requirement as well." Standard military specification cable that we manufacture are RG 141, 142, 144, 165, 178, 179, 180, 187, 188, 195, 196, 225, 302, 303, 304, 316, 316DS, 400, 403 and RG 404. They meet or exceed US MIL-DTL-17 or MIL-C-17 specifications. We also manufacture ETFE coaxial cables for nuclear applications as well. Please contact us for any custom requirements. Attenuation of cables processed by us is 10 to 25% lower than the permissible maximum given in US MIL-C-17. Low micro-phonic noise cables (less than 5 micro-volts) for sensitive transducer interconnects and very low capacitance cables for instrumentation (e.g. 1.8 mm OD with 40 pF/m). ABBREVIATIONS: BC: Bare Copper, FEP: Fluorinated Ethylene Propylene, GCSR: Garg Composite Semi-Rigid GLN: Garg Low Noise GSR: Garg Semi Rigid,PTFE: Poly Tetra Fluoro Ethylene, S: Silver Plated Copper, SCW: Silvered Copper Weld (also known as SCCS: Silvered Copper Coaled Steel),T: Solid PTFE, TA: Airspaced PTFE, TSC: PTFE Semi Conductive coaled, VFG-2 Varnish fiber Glass Double braid. 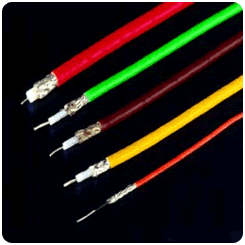 Note The cable types with FEP jacket are given for equivalence purpose only and are offered by us. Actuals are listed to indicate superior performance in some respects.